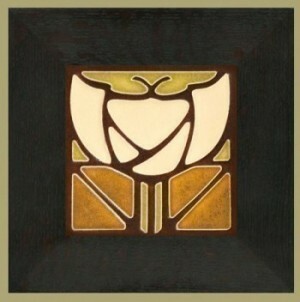 Dard Hunter's Tulip design from the cover illustration for the Roycrofters "Little Journeys" series, as adapted by Motawi Tileworks. These 4x4 inch tiles look stunning in our own handmade quarter sawn white oak frame molding. Pictured here framed in our 2" wide, mitered "Oak Park" style molding stained in our Ebony finish. Also available in our "Legacy" style 3 inch wide frame molding - hand selected to ensure the best finish, with a slight bevel to the molding to draw attention to the tile, or available unframed. AND NOW FROM DARD HUNTER STUDIOS: Select one of 3 color choices for our hand applied finish at no additional charge! All three look fantastic with tiles by Motawi Tileworks.